The original script used a dog lifting its leg on a tree to trigger our boy into the “gotta go” reflex. 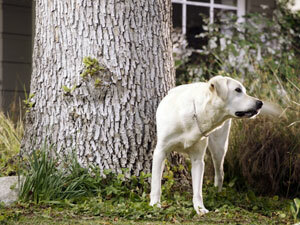 The dog, however, was such an issue with network compliance that we opted for the safer, “peeing statue” shot. The dog was trained to lift its leg on command in about two days time. It did make the extended web version. We just thought the peeing fountain was funny. Turns out, it’s a famous statue in Brussels. It’s still just plain funny. Our mom character was written into the script to establish some adult pool supervision. Originally she also comes into the house to stop our boy ”Tommy” from doing whatever he was going to do with the ficus tree. Nice shot for the web version, but didn’t make the :30. Beth Thieme is the actress. She’s great. Whew. The Super Bowl is over. We survived and you gotta admit, in spite of a fair amount of tension and suspense, it was fun. JWM has been collecting online news mentions of TaxACT and their Super Bowl spot starting with announcement day about two weeks prior. We count 225+ online articles to date. Not bad exposure. The big buzz this year seemed to be about releasing Super Bowl commercials early, in advance of the Super Bowl. Only two advertisers pre-released in 2011, and about half of the advertisers pre-released this year. Wow. Talk about jumping on a bandwagon. This has really become quite the media circus now, with big brands throwing a lot of effort and budgets behind marketing their Super Bowl ads in advance of the game. TaxACT decided not to pre-release and I agree. It seems that the suspense should be part of the package, and part of a true TV ad viewing experience. They did, however, get a request to be the exclusive preview on NBC’s Today show, the Friday prior to the game. We thought that spoke pretty well of the spot to be one of maybe 8-10 commercials they chose to use as an example over the course of three different news segments. Tough to pass up. How do we come up with these ideas? There’s a backstory to the ”Free to Pee” TaxACT commercial. While a team of people at JWM worked on the spot concept through completion, the inspiration for a concept can come from anywhere. Fun story by Jeff Westrom’s daughter, Tiffany Westrom, for the Iowa State Daily. So how’d the spot do? We’re using the USA TODAY ad panel ratings, which has been the standard since 1989. The results: Number 11 out of 54. We’re feeling pretty good about that, considering the names ranked below us.